Do you happen to have a favorite recorded version of baby shark? Don’t ask me why, but the pacing of my do do do do do dos can be erratic! Love these felts; off to the crafting room I go! Unfortunately I don’t know of any recorded version of Baby Shark. I just try to go really slow so the little ones can keep up with me. Thanks so much, Becky! There is a fun version of “Baby Shark” on a CD called Early Morning Knee-Slappin’ Tunes by Mike Whitla that is very toddler-friendly! Oh, perfect! Thanks so much for sharing! Thanks for the share, I am planning on using this in a story time this Wednesday, but am adapting it slightly to be Baby Dragon :). I think it will be a blast! Oh that will be so much fun! How will the second half of the song go? I have a newbie question. How do you make the felt characters? I’d like to do more with my flannel board besides the letters and numbers I bought from the local craft store. Note-we’re a tiny, rural library with limited resources. Thanks! Thanks for the info! Very helpful as always! Just did “Slippery Fish” for the first time for my Ocean themed Stories in the Park today! It was really fun and the patrons played right along 🙂 I used the books Somewhere in the Ocean by Jennifer Ward, Little White Fish by Guido Van Genechten, I’m the Biggest Thing in the Ocean by Kevin Sherry (PERFECT prelude to “Slippery Fish” 🙂 and A Hole in the Bottom of the Sea, adapted by Jessica Law with an accompanying felt board. SO MUCH FUN! Thank you once again for helping to make our storytimes more fun! 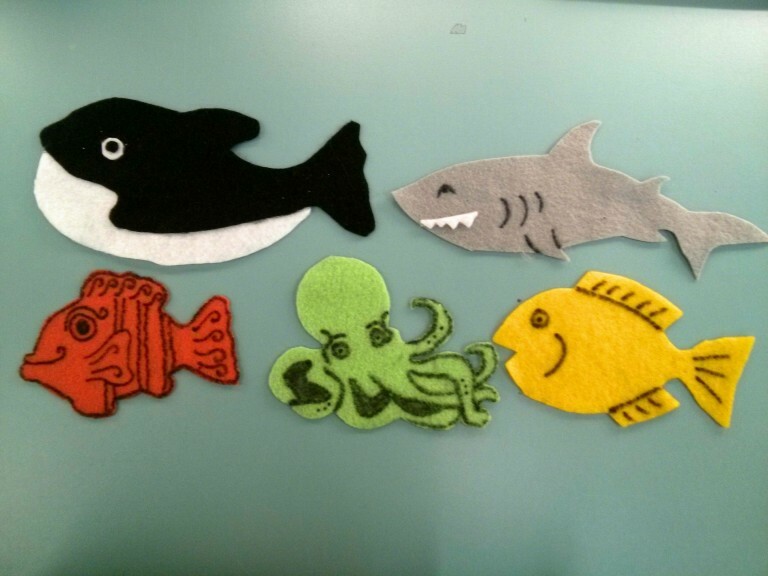 Check out my post Stories in the Park: In the Sea on Wild About Reading blog with Tompkins County Public Library if you’d like to see the felt board! I’m the Biggest Thing in the Ocean is one of my all time favourite storytime books. Always a hit! 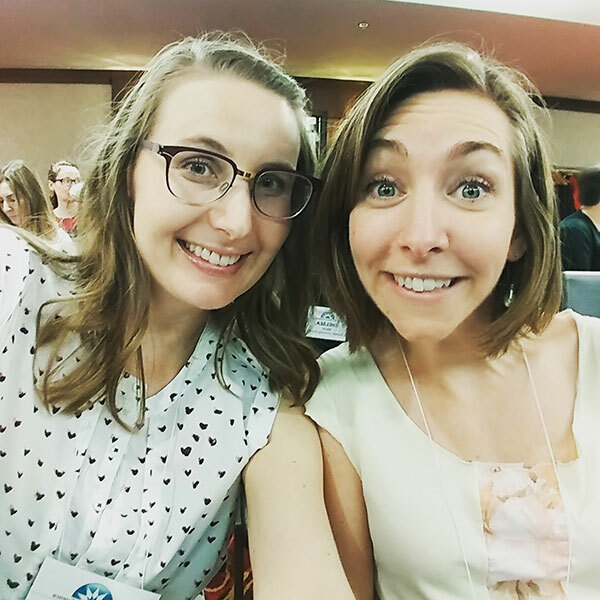 I subscribe to your blog and saw your shout out to Jbrary today – thank you so much! Hi! Do you know where I can get the die cuts for all of the sharks? I would love to add this to my storytime, but I’m not the craftiest person. I love all of your flannels and songs! Love this site! 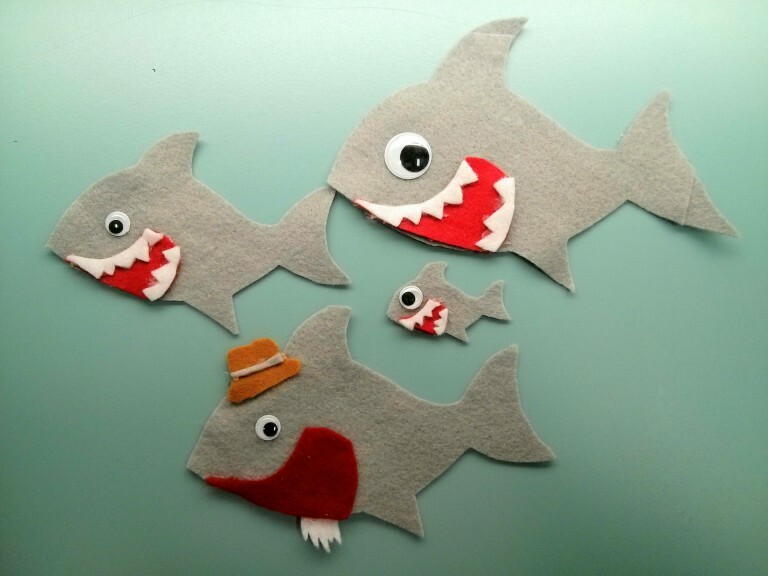 If you want to add some baby-appropriate STEM to storytimes tell your audience the fun science fact that mommy sharks are bigger than daddy sharks! And adjust your dance moves and flannel order accordingly! Go Go, great big mommy sharks, go!